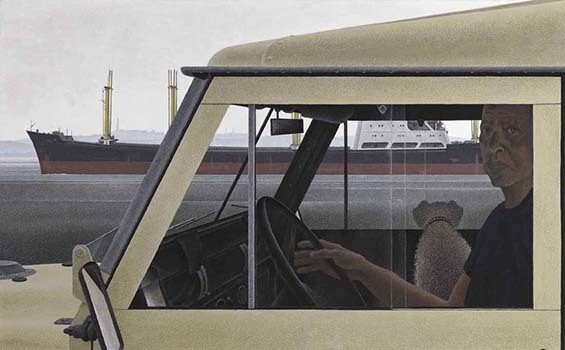 Harbour brilliantly shows both the directness and mystery typical of Colville’s strongest compositions. A response to everyday experiences – being intrigued by the freighter he saw in Halifax Harbour in 1975 and wanting to paint his own Land Rover ("something that I have been wanting to do since I bought the car," he reported) – the work is not content to have us rest on the precisely rendered surfaces that we are invited to contemplate. Meticulously composed on geometrical principles of harmony and balance, it is rendered with Colville’s characteristically precise Pointillist technique. But Colville is always a rigorous editor, showing us just enough to create questions in our minds. 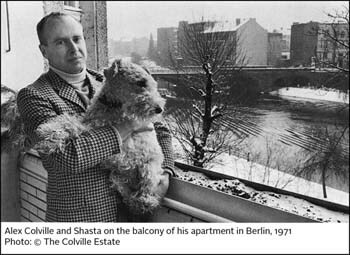 For example, while the family dog Shasta’s coat is rendered in full and loving detail, we cannot read the gauges on the Land Rover’s dash. Colville loved cars. He provides full detail about this one’s exterior, perhaps so that we can compare it with the technology of the nearby boat. The visual detail at the bow of this ship suggests waves and thus movement. But is the car moving or still? We do not know. While Colville’s paintings typically circle around the quotidian experiences that he believed were the most important in our lives, he was careful not to make them too personal or idiosyncratic, not to reveal much about himself. 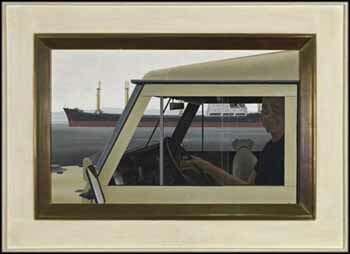 The driver here is clearly based on Colville’s appearance, but Harbour is not a self-portrait in the conventional sense. The dog’s gaze in the direction of the freighter that we as viewers are invited to look at appears in sharp and enigmatic contrast to the driver’s pointed stare towards us. Here Colville wants us to think beyond the surfaces of his painting, beyond its obvious details, so that we may reflect on large, existential questions such as the nature of human versus animal perception or the relationships we have with the machines we build. It is on this plane that we discover the magic in his Realism. This work is in the original frame made by Colville.